Activities done by ACVic Centre d'Arts Contemporànies in 2013. ACVic is the result of a collaboration among the Ajuntament de Vic, Departament de Cultura of the Generalitat de Catalunya and H. Associació per a les Arts Contemporànies. ACVic Centre d’Arts Contemporànies is a public cultural venue which promotes the creation, production and exhibition of proposals in the visual arts, as well as in other contemporary artistic disciplines. 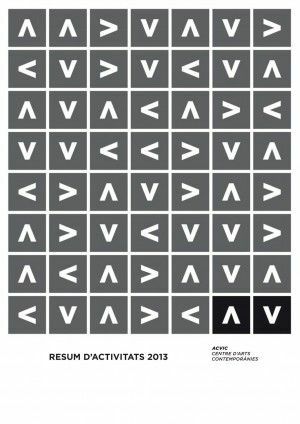 ACVic is a territorial/local centre of the Public System of Visual Arts in Catalonia. Through its activities, it serves to encourage artistic creation, production and distribution and at the same time show itself to be a centre committed to its immediate environment. In addition, it seeks dialogue with national and international contexts to broadcast its own activities, and, in order to receive artists and cultural agents to interact with their experiences and to be involved in global issues of contemporary arts. ACVic Centre D'Arts Contemporànies follows a trend of action centred on the relationships among educational activities, territory and social interaction. Art and education, interlaced together, facilitate production spaces which favour experimentation, and an understanding of artistic practices as practices affecting, interacting and transforming social space. From this approach ACvic proposes to generate an area of confluence between artistic production and educational action, so that the education becomes a pioneering activity incorporating mechanisms of research, dynamising art production aspects, stimulating participation and displaying devices of visibility and communication of the arts. ACVic is submit in the Àrea de Cultura i Ciutadania de l'Ajuntament de Vic and forms part of the Xarxa de Centres Territorials d’Arts Visuals de Catalunya, a public net with Bòlit Centre d’Art Contemporani de Girona, La Panera de Lleida, MAC de Mataró, La Pati Centre d’Art d’Amposta, Centre d’Art de Tarragona, Tecla Sala de l’Hospitalet de Llobregat y Fabra i Coats Fàbrica de Creació de Barcelona.